Kilsyth Rangers enjoyed a comfortable passage through to the second round of the West of Scotland Cup for Rangers with a 3-0 win over Girvan at Duncansfield. They were never really stretched by the visitors and in the end the winning margin could easily have been much greater. The first quarter of an hour saw little action with neither goalkeeper being tested. But then Danny Smith made a good run in and won a corner kick from which Drew Wingate headed the ball home. Rangers were now dominating the game and Smith made another good run in, only to have his shot blocked. However Smith was posing all sorts of problems for the Girvan defence and it was fitting that he should get the second goal, a curving shot which deceived Ally McInnes, coming off the inside of the near post and into the far corner of the net. There could have been more goals before the interval but Rangers were quite happy to go in with a two-goal lead. And they were further ahead only five minutes into the second half as a breakaway resulted in Salim Kouider-Aissa being one on one with McInnes. 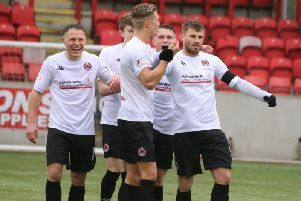 The Kilsyth striker rounded the keeper and guided the ball into the empty net for his 19th goal of the season. The rest of the second half was really a walk in the park for Rangers; they showed some very good passing football and really should have increased the score. Substitutions were made on both sides, Michael McKay coming on for Owen McGoldrick and Franny Kelly replacing Jon Tully late on for Kilsyth. Girvan also made a couple of changes but it altered nothing, they had never looked like causing an upset. The draw for the second round took place at Troon immediately after Saturday's games and Rangers will travel to meet Lanark United, probably early in the new year.